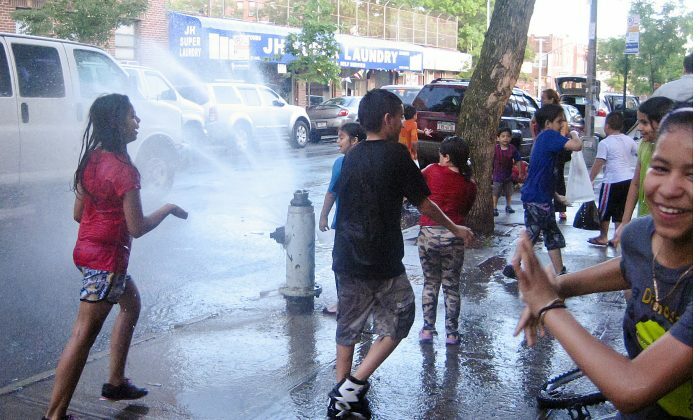 NEW YORK—Summer heat has moved into the city, yet while the adults are trying to install fans and air conditioners on June 1, the local kids in Jackson Heights, Queens, had their own idea of keeping cool. An open fire hydrant sprayed cool water out into the street as groups of kids played, and this was seen on several blocks in the neighborhood. On the corner of 94th Street and 35th Avenue, near an open hydrant where kids were playing, a woman cradling a baby sat on the steps of a building talking with another parent. A car up the street was parked with its doors open, playing Latin music while other locals stopped to chat on the curbside. Three South Asian girls wearing blue and orange saris leaned out their third-floor window sill to watch the fun. Some drivers also took advantage of it for a free car wash, and slowed down to let the water wash over the right side of their vehicles. The kids caught onto the service their fun was providing and decided to cash in on it. They started holding up an index finger to indicate their $1 fee to use the water. One girl excitedly said they made $10 through the day, noting “one guy gave us two dollars!” The kids soon gave up their newfound business, however, and decided to just chase each other with tupperware or plastic bags filled with water. A UPS worker with long, curly hair jumped down from his van, ran over, and put his whole face into the water blast, before throwing his hair back like a shampoo model and hopping back into the van. One man wagged a finger disapprovingly, but most gave a thumbs up or warm smile and moved along. Some people walking along the sidewalk took a chance to wash their hands or enjoy the cool spray, a few scampered by as quickly as they could. A police siren jarred the kids for a minute. “They’re gonna try to stop us,” one little boy said. But when the police van drove up they just gave a friendly wave. As evening fell, kids were still splashing in the water, some with towels draped over their shoulders after a day well played.